Here is a recap of what happened in the order I believe they took place in. Or you can skip to an event by clicking on it below. Matthew Hart kicked things off in the first round with a 40′ 2″ toss. 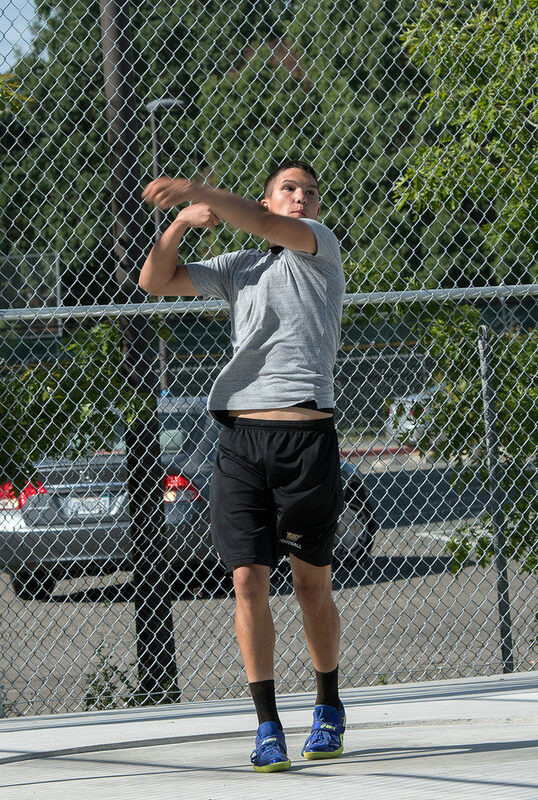 Jon Johnson was next up with a 39′ 5″ followed immediately by Maximiliano Sanchez who had the same mark at 39′ 5″. Meet favorite Ruben Mehler could only land his at 39′ 1″ to sit in fourth after first round. In second round Sanchez temporarily moved into 2nd with a better #2 toss than Johnson but after them Mehler cranked one out to 42′ 6″ which no one would come close to the rest of the day. Fourth round saw Drake Barich getting into the mix with a 39′ 9″ and then in the 5th round he passed everyone but Mehler with a 40′ 11″ PR. 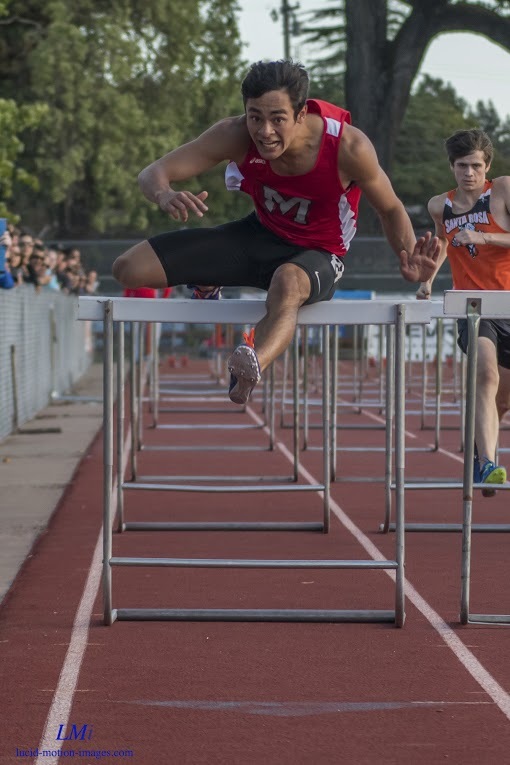 Also in round five Sanchez moved to 4th with a 39′ 10.5″ mark to seal the top five places. 7 Reeger, Kyle         Casa Grande            37' 11"
8 Voight, Jacob        Casa Grande            36' 10"
The top seven jumpers all had no misses through 5′ 8″. At 5′ 10″ Jacob Williams and Waisea Jikoiono would sail over the bar on their first attempts while Carter Kennedy and Mason Adams would need two to clear. Jikoiono who has been the top jumper all year would continue on to clear both 6′ 0″ and 6′ 2″ for an easy win. 8 Murgatroyd, Ryan     Maria Carrillo         5' 6"
David Alviso would get the first 40 footer of the night with a first round 40′ 2″. Duilio Froes would respond with a 41′ 4.5″ jump that would be more than a foot farther than anyone could come within this day. 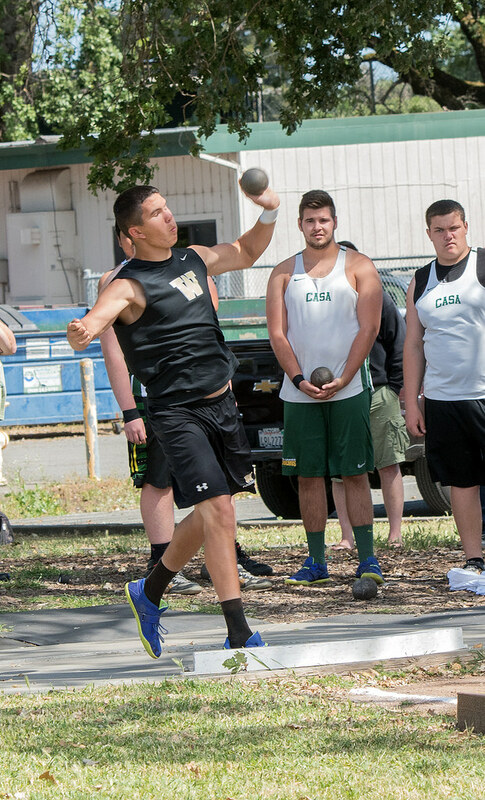 Mason Adams would PR at 40′ 2.5″ in the second round to lock up 2nd place leaving Alviso in third. In that same round Casey Mclaughlin (39′ 11.5″) and TJ Prescott (39′ 6.5″) would both PR to grab the next to spots. 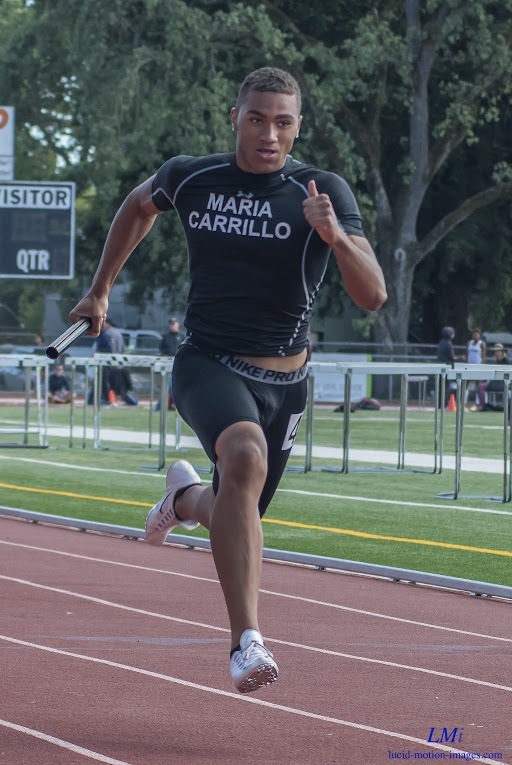 Maria Carrillo (Nate Downing, Severin Ramirez, Demetre Coffey, Tyler Van Arden) left everyone else in the dust, remember the old dirt track days, becoming only the eighth team in Empire history to brake 43 seconds and the first in NBL meet finals history to run that fast with FAT timing. 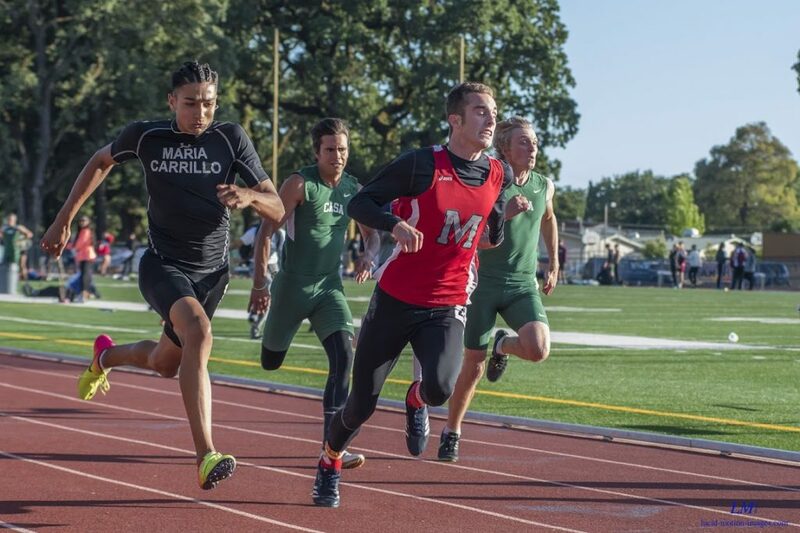 Casa Grande (44.50), Montgomery (44.88) and Santa Rosa (44.99) would all run season bests for the next spots. 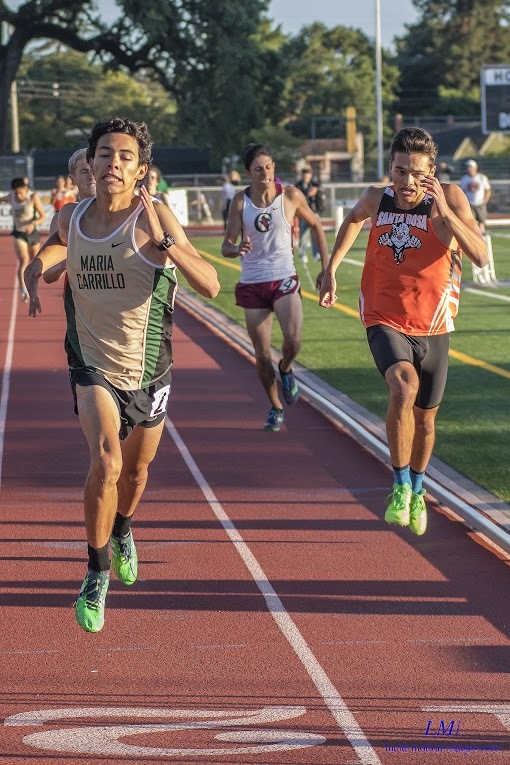 As expected Luca Mazzanti defended his 1600 title with only Benjamin Lawson putting any preasure on him. An unexpected battle took place in the vault this year. Cooper Plattus looked like he would have an easy time as no one was even close coming in to his 13-10 PR. Someone forgot to tell Hunter Wagner as the lead would go back and forth thru the day. Wagner cleared his opening height to take the lead at 10-6 with Plattus passing. Wagner would pass 11-0 as Plattus and Seren Stegner would both clear that height on their second attempts. Stegner would end his day there with Plattus passing 11-6 making Wagner the new leader when he cleared that. At 12-0 Wagner continued to hold the lead after he scaled that height on his first attempt and Plattus took two to get over. Plattus passed at 12-6 while Wagner cleared it for a new PR height for himself on his third attempt. At 13-0 Wagner again upped his PR with a first attempt clearance putting huge pressure on Plattus. Plattus responded by also clearing on his first attempt. Neither would go any higher with Plattus earning his first NBL title based on less misses during the competition. Even more than with the shot Mehler dominated this event. His 137-5 opening throw was well beyond what anyone else could muster this meet. Brian Day was second with his first round 109-11 with Barich not locking down third until his third round 108-9. Second best mark of the meet actually happened in the JV portion as Torron Henderson of Ukiah won at 110-6. 7 Cobb, Brandon        Santa Rosa             99' 8"
8 Sanchez, Max         Montgomery             89' 9"
Casey Mclaughlin was a bit off at the trials Wednesday but not today. Mclaughlin leaped to 20-0 on his opening jump and really was never challenged. 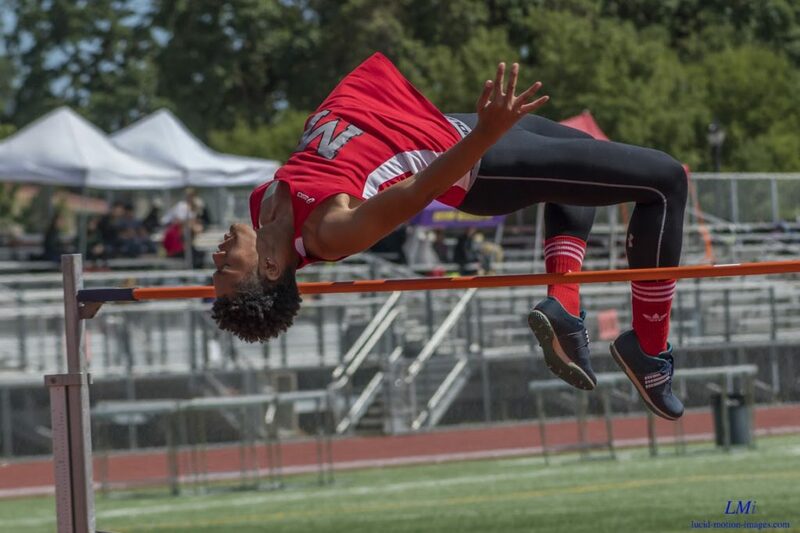 Duilio Froes was the only NBL jumper to go over 21 feet so far this year but his 19-6 opener was close to all he would go here and ended in second after adding another 1/2 inch to that in the fifth round. Mclaughlin was out near his PR in the second round with his 20-8 jump. Cole Kuper had a good day taking third with a 19-2 1/2 jump. Best match up of the night was four lanes removed from each other. Thomas Thomsen has been fending off Zack Nelson all year but after a disastrous run in the trials he only made the finals in lane eight as one of the top 8 qualifiers dropped the event. Nelson ran strong in lane four (15.35) with Thomsen more than making up for the trials with a huge PR clocking 15.07 moving him to 38th All-Time. Tyler VanArden truly ran away from the field as he became only the 5th sophomore in Empire history to break 50.5 with his near 1 second win over 2nd in 50.45. Demetrie Coffey was even farther ahead of third place Justin Patterson but should provide a great final next year as all three are back. Blazing fast final with a surprise winner. Severin Ramirez found the perfect time to find his afterburners as he nipped Jaymes Tischbern at the line in a new PR 11.09. Three more runners were hot on there tails as five broke 11.5. 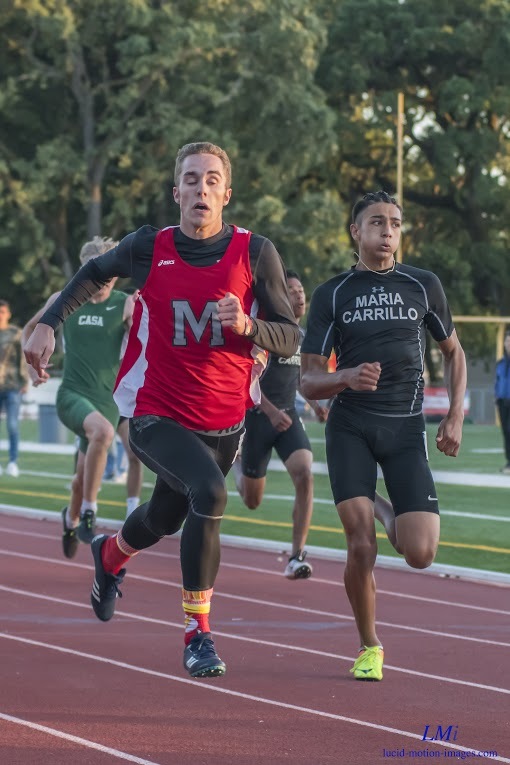 I’m guessing Will McCloud like seeing a sophomore pull off an upset in the 100 because he decided to do the same in the 800 with his 1:58.57 PR. Langston Hay did a little of his own taking second in a first time under 2 minutes with his 1:59.10 over Mazzanti’s 1:59.96. 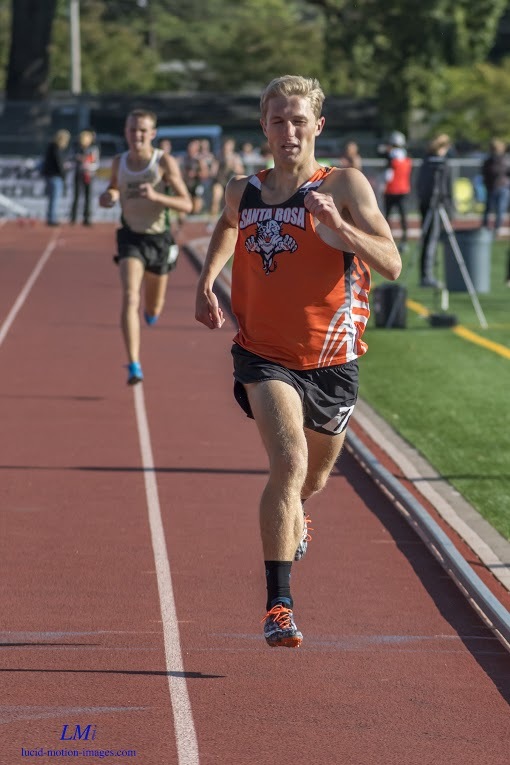 Looks like being sophomoric is a good thing as Brayden Glascock made it four events in a row with a sophomore winning being the only runner here who could crack 41 seconds. 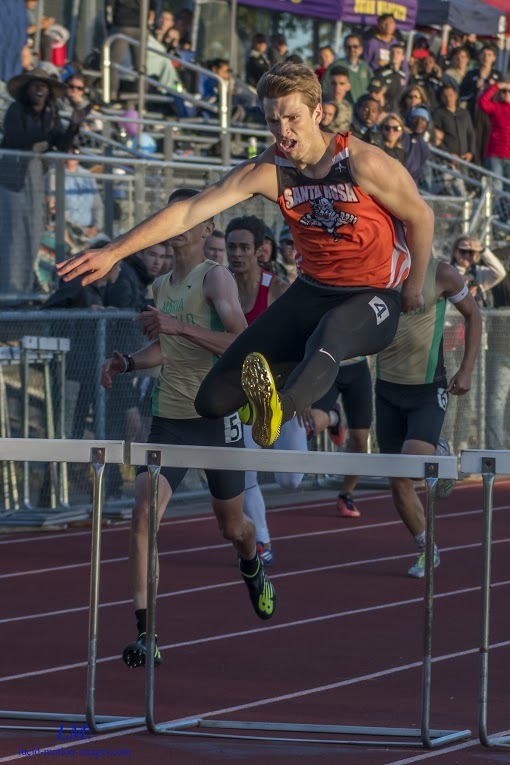 Tischbern, still only a junior himself, decided to put a stop to the sophomore streak as he defended his 200 title over this years 100 and 400 champions. Amazing time running into a -2.5 wind. Robert Swoboda finished with a whole straight away between him and second place as he cranked out the 35th fastest 3200 ever in 9:32.95. Teammates Scott Kruetzfeldt, Zach Lindemann and Benjamin Lawson took the next spots. 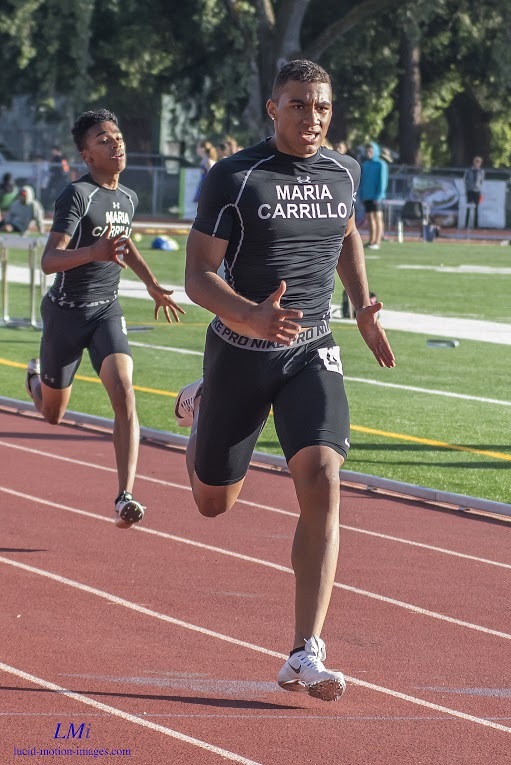 As with the girls race Carrillo runners (Severin Ramirez 51.2, Will McCloud 51.8, Demetre Coffey 53.7 and Tyler Van Arden 50.3) averaged over a second better than second place Montgomery (3:33.10) as the Vikings and Santa Rosa (3:37.32) both had season bests. Maria Carrillo continued to roll over the rest of the NBL as they scored over 100 points for the sixth year in a row. 4' 6"4' 8"4' 105' 0"5' 2"5' 4"
8 Olivera-Vera, Xochip Santa Rosa             30' 4"
7 Farris, Jack         Casa Grande            78' 2"
8 Murcia, Bryan        Rancho Cotate          72' 1"